Matched Antibody Pair kit is a titrated unlabeled capture antibody, a titrated biotin-labeled detector and a calibrated protein standard. 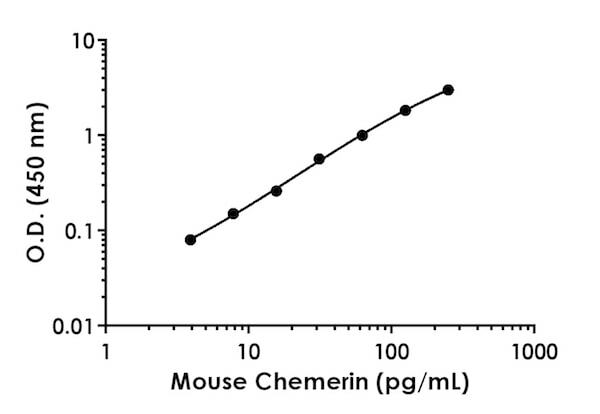 The Matched Antibody Pair Kit can be used to quantify native and recombinant mouse Chemerin. Both capture and detector antibodies are rabbit monoclonal antibodies. Optimization of the kit reagents to sample type, immunoassay format or instrumentation may be required. Guidelines for use of this kit in a standard 96-well microplate sandwich ELISA using HRP/TMB system of colorimetric detection is described in this assay procedure for the purposes of quantification. Additional protocol information and tips on the use of the Matched Antibody Pair kits for sandwich ELISA can be found on our website. For additional information on the performance of the antibody pair used in this kit, please see our equivalent SimpleStep ELISA® (ab204520) which uses the same antibody pair. The capture antibody is glycerol free. The detector antibody contains glycerol. Our Abpromise guarantee covers the use of ab214483 in the following tested applications. Standard calibration curve. Background subtracted values are graphed. ab214483 has not yet been referenced specifically in any publications. Publishing research using ab214483? Please let us know so that we can cite the reference in this datasheet. There are currently no Customer reviews or Questions for ab214483.